I'm not going to share the number of tank-on-tank battles I've completed to this point because, honestly, I lost track long ago. 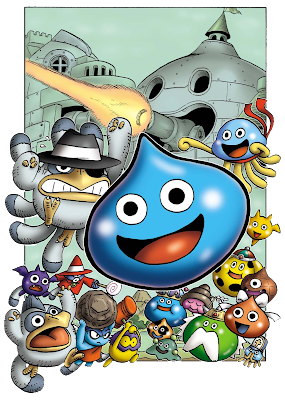 Suffice it to say, I've taken part in a fair few in the nearly nine hours I've spent with Dragon Quest Heroes: Rocket Slime. An interesting note about those aforementioned tank battles: although I wasn't a fan of them during my first week with this DS title, I've come to adore them in my second. That's chiefly because I finally progressed far enough in the game to unlock the ability to add a few crew members to my trusty Schleiman Tank--which not only makes these battles more mentally manageable but also more strategic and even fun. Aside from that, I'm still thoroughly enjoying Dragon Quest Heroes: Rocket Slime's charmingly realized graphics, cheerful soundtrack and of course the rest of its captivating gameplay (which is centered around the slippery protagonist's "Elasto Blast" move and ability to stack friends, enemies and items on his pointy little head). As such, I now know without a doubt that I'm not going to stop playing this game until I see the credits roll, and I have a pretty good feeling that's going to happen sometime in the next week. Can you believe I may actually finish one of my "Bye-Bye, Backlog" selections--and possibly before the month is up? Hooray! I'm glad you love it! And finish it! It's worth it. Umm...I just finished Uncharted 2 and Flower, finally. And I'm working my way through The Unfinished Swan. FFIX is on the back burner a bit...I'm kind of over it. Wow, you're making really great progress, Justin! Sorry to hear you're over FFIX, though. Why is that, BTW? What turned you off the most?